Selling a home can be overwhelming and time-consuming, and that’s even before you actually list it! 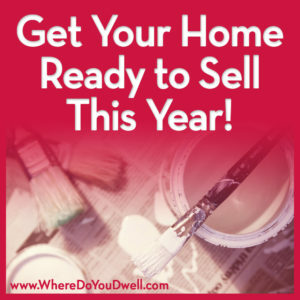 If you’re even thinking of selling this year, then you need to start getting your home (and even yourself) ready and prepped as soon as possible. It’s also important take the time to understand your local housing market and to reach out to a recommended real estate agent for guidance at this early stage. Here are some important steps to help get you going as you begin the process of listing and selling your home. It doesn’t have to be stressful, if you have a plan in place. Prepare your property and fix what’s broken. It’s that simple! Look at your home with fresh and unbiased eyes as though you are a new visitor. You’ll see where it needs a fresh coat of paint or discover that loose knob you’ve lived with way too long. Make a list of all the nagging items that bother you and fix them. Your agent can give you guidance on what you should spend money on if you’re uncertain. Your home should be in tip-top shape before you list it. Stay on budget or know your potential return on investment. You may have to spend money to earn money but not all home improvements are worth it. So be careful and don’t overdo it. How much return you’ll get will depend on what was done and how it appeals to the most likely buyer of your home. Your agent can help you on this since they have seen it first-hand on what is worth it for your particular neighborhood or potential buyers in the current market. If a certain type of countertop will help sell your home for a better price, then they will know! Set specific goals and map out a time table with deadlines. Schedule certain times each week or month to work on prepping your home with specific tasks or DIY projects (i.e., tackle basement, paint bedroom, etc). Your timetable will depend on when you want to list it and how much will need to get done. Now is the time to get bids from outside contractors on any projects and to also get a sense of the timeframe for completion. Clear away clutter. You don’t want your home to look cramped and clogged with too many personal items. Buyers like to see more of a clean slate now and your agent or a staging company can give you specific advice for your home’s needs. Start today with paring down your belongings – sell on eBay, have a garage sale, donate, or recycle or trash. This can take time so set a schedule for yourself. For those items you want to keep, consider finding a place or purchasing a storage unit to store furniture and other items while your home is on the market. Keep it clean. every. single. day. Dirt, stains, and pet or food smells can turn off even the most receptive buyers. If you don’t have a cleaning service, now may be the time to get one. Don’t forget to wipe down those countertops in the kitchen and bathroom before you have a viewing. Store a few of those disposable wipe containers in each bathroom and your kitchen for a quick and easy clean up as you head out the door! Make it as move-in ready as possible. Today’s buyers are not crazy about doing repairs and replacements (They just like watching DIY shows!). Most buyers do not want an immediate to-do list. Talk with your agent about whether you should leave something “as is” or replace it. An older roof, stained carpet, or a warped fence can bring down the price or your home. Determine what is best for your sale financially. Again, your agent can provide input on this. Today’s buyers are better prepared than ever. They’re totally tapped into technology and do their own electronic searches, receive seller disclosure forms, order home inspections, etc. Make sure you’re just as informed and prepared as them. Promote you home using tech-savvy marketing on the Internet, social media, and smartphone. Your agent should work on getting the word out to other agents and potential buyers. Together you can come up with a marketing plan that will bring foot traffic to your home. Who will find your home and neighborhood appealing? That’s who you want to target and how best to reach them. Online photos should sell your home. Buyers spend lots of time viewing online listings and posted photographs to get an idea on what homes they want to actually visit. So your photos need to have “curb appeal” in every single shot! Don’t scare away buyers with dark, unimpressive photos or even a lack of photos.Also, if you plan to sell your home in an offseason when your yard isn’t at its best, plan to take pictures when the azaleas are in bloom or your patio is “staged” for entertaining. You can still use these photos later on so buyers can see your lovely property and how it is used at that time of year. But, remember, this takes pre-planning! Whatever you do, don’t take your own photos. Our photographers have the correct lens to make sure you home looks large and bright. Appeal to a buyer’s emotions. Not only do you need to appeal to a buyer’s mind and wallet, but you also need to make their heart skip a beat. How do you do that? The answer depends on your particular home and your most likely buyer. Stage your home so that buyers can envision themselves living in your home. You can work with a professional stager for guidance. Set your dining room table for entertaining; create a haven for gaming or media viewing; set up a reading nook with a cozy blanket; or bake cookies for a “homey” smell during an open house. Study sales prices, not asking prices in your particular neighborhood. The true market is based on what buyers are willing to pay right now. Basically, buyers will only pay what they deem your house is worth in current market conditions. Be willing to price your home competitively from the get-go. Take advantage of the first two weeks of showings that bring the most traffic to your home. Even if you mistakenly price your home slightly low, you’ll get multiple offers. You can’t go wrong … unless you price your home too high and it sits, and sits, and sits. Remember that all real estate is local. The particular street or block you live on can be a strong influence on how to price your home, and how it appeals to buyers right now. Work with an agent who is an expert in your particular neighborhood, who knows the ins and outs of what is selling and what isn’t, and even who is buying and why. Go with the flow of the market. It can be more productive to sell your home in the spring or even fall, when the market is the busiest with more potential buyers. However, sometimes quieter periods around the holidays or wintertime can be a good time to sell. There’s less competition from other listings and more serious buyers who need to find a place to live. Your agent will know how to best show and price your home depending on the time of the market. Prepare yourself mentally and emotionally. You have fond memories about living in your home. It has your personal imprint from the way you have lived there to how you have decorated it. It’s time to think of selling your home as a “business transaction”. It can be hard to do, but try to distance yourself and view it as a financial opportunity for the next phase of your life. You need to stay focused on getting your home sold, and so you can buy your next one. Be flexible and welcoming. Having people go through your home can be stressful and a pain (We know!). But you want to be able to welcome potential buyers at any time they want to come, if possible. Remember the outcome … you want to move! Find ways to relieve the stress on you and your family. Make a list of things that will bring smiles to help everyone get through the time your home is on the market. This is not the time to skip the gym or cancel your weekly yoga class. Plan an afternoon movie marathon at your local theater during an open house or arrange an all-day trek to Ikea for some design and storage ideas for your next home. If you have small children, have a fun bag of games or planned outings to surprise them when you need to ditch home at the last minute. As you can see, selling your home is a “project” that takes work and planning. But it can be done and it will be so worth it once you’re in your new home. If 2017 is the year to make this happen, then start today. We are here to help you!